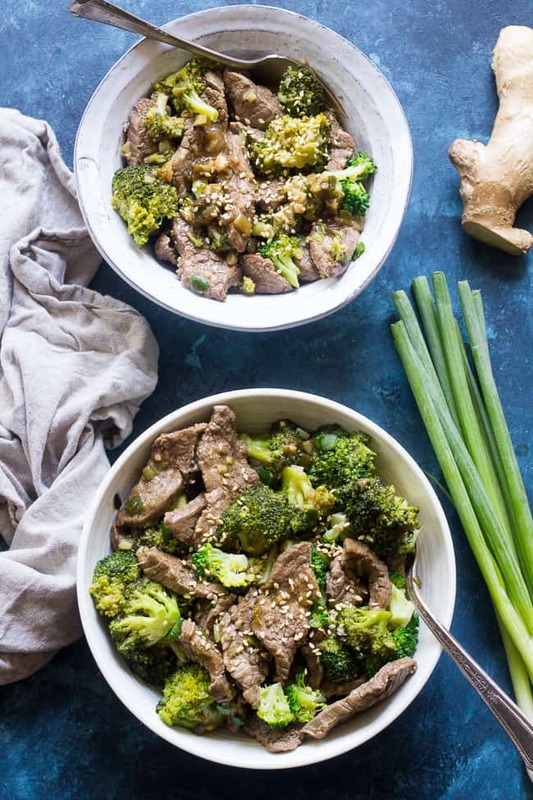 This Paleo and Whole30 Beef & Broccoli stir fry is perfect for weeknight dinners! 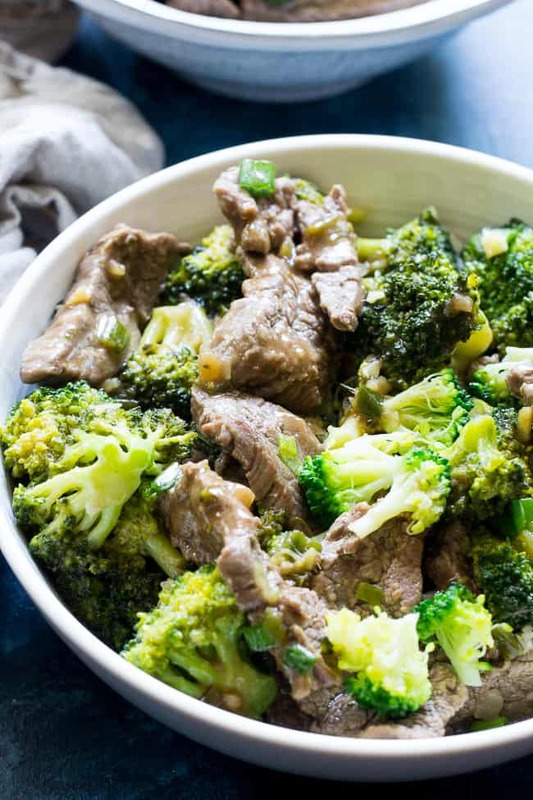 Thinly sliced flank steak in a sesame garlic sauce with crisp tender broccoli that’s ready in 30 minutes. You can serve this alone or over cauliflower rice and it’s soooo yummy! Gluten free, paleo, low carb, Whole30 compliant and kid approved! 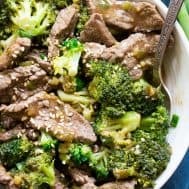 Beef with broccoli – this was my standard Chinese takeout order since I was about 13 and finally outgrew my chicken lo-mein cravings. Nothing against lo-mein – it’s deee-lish, but beef & broccoli with pork fried rice was my go-to at least once a week for probably 10 years, maybe longer. 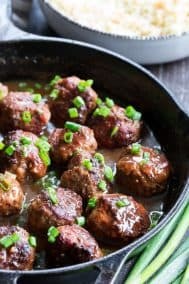 I shied away from re-creating takeout meals for awhile, mainly because I never actually COOKED these meals prior to going Paleo (ah, takeout), and felt intimidated by first learning the original ingredients/methods, and then trying to make-’em Paleo. Anyway, I started with this easy (yes, really!) 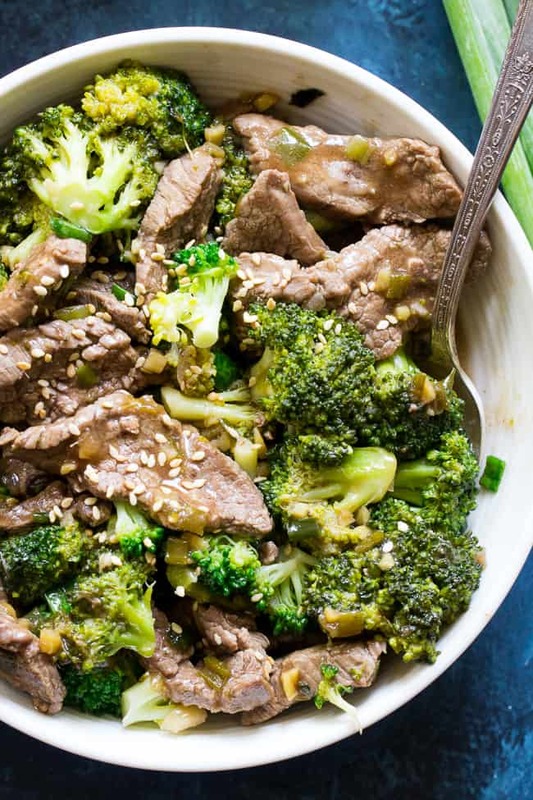 beef & broccoli stir fry and have since moved on to a few of my other favorite Chinese takeout re-creations, which I’ll share with you guys over the next few weeks. 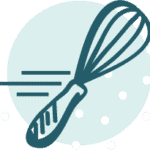 Interspersed with desserts, fall baking recipes and such. By the way, can you believe we’re even discussing fall baking already? But it’s really, really here. I mean, it’s August-flipping-23rd already! Summer vacation is gone and PSLs are probably being sold as of this week. Or last. 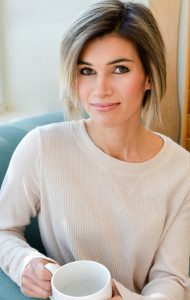 Who knows anymore with these PSLs – they’ve taken over the fall and are moving straight up into summer. But why don’t we chill on the pumpkin for a moment (while we can) and dig our forks into this beef. After doing some research, I decided to go with flank steak even though it can be tough, since in my experience it’s more flavorful than other cuts, and if you slice it nice and thin against the grain and don’t overcook, it comes out perfectly in my opinion. The quick marinade helps to tenderize it as well. However, if you have another cut in mind that you’d like to use, go right ahead and use it – this is YOUR dinner, after all! The key to making this meal a breeze is PREP! I’m not the best at prepping – I totally admit it. But for those of you who regularly meal-prep, you will have a much easier time with this since there’s a lot of chopping/slicing/mincing prior to actually cooking. But enough about my broccoli woes – it’s time to cook! 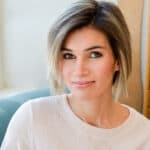 All ingredients listed for this recipe are Paleo and Whole30 compliant – however, for some ingredients (such as fish sauce) you will need to buy specific brands to avoid sugar and additives – just click the hyperlinks to view the brands I buy and use myself. I think we’re ready to begin – let’s go!! 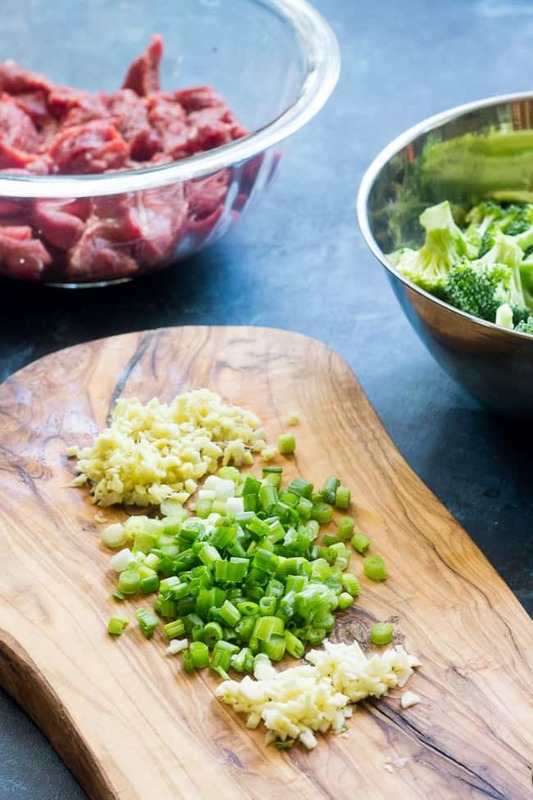 This Paleo and Whole30 Beef & Broccoli stir fry is perfect for weeknight dinners! 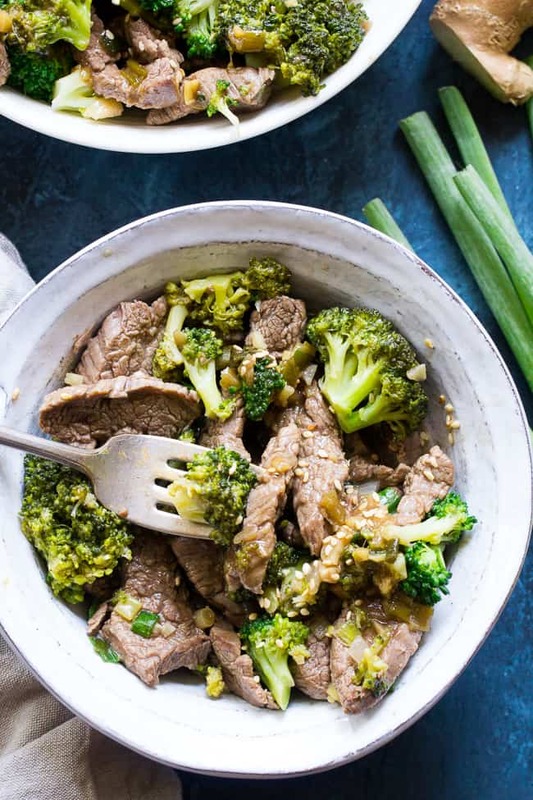 Thinly sliced flank steak in a sesame garlic sauce with crisp tender broccoli that's ready in 30 minutes. You can serve this alone or over cauliflower rice and it's soooo yummy! Gluten free, paleo, low carb, Whole30 compliant and kid approved! 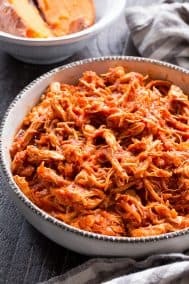 For the sauce, whisk together the 6 Tbsp coconut aminos, 2 tbsp water or broth and tapioca or arrowroot starch until dissolved, then whisk in the remaining sauce ingredients until well combined, set aside. Make sure to have all your ingredients prepped and ready to go before beginning to cook the broccoli. To cook the broccoli, heat 1 tbsp coconut oil in a large skillet or wok over high heat. 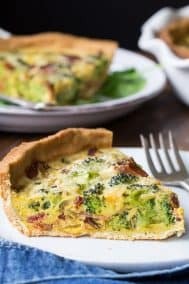 Add broccoli and toss to coat, then lower the heat, add the 2 tbsp water and cover the skillet (anything that mostly fits will do) for about 30 seconds, until bright green. Remove to a plate and set aside. Remove the skillet from heat and allow it to cool enough to wipe out any water/broccoli pieces. Add the second Tbsp coconut oil to the skillet and heat over high heat. After preheated, add the sliced beef in a single layer and brown on one side - this will happen very quickly. Use tongs to flip the beef, and immediately add the garlic, white scallions, and ginger, stir to combine. Add the sauce and continue to stir and cook for about 1 minute, until thickened. 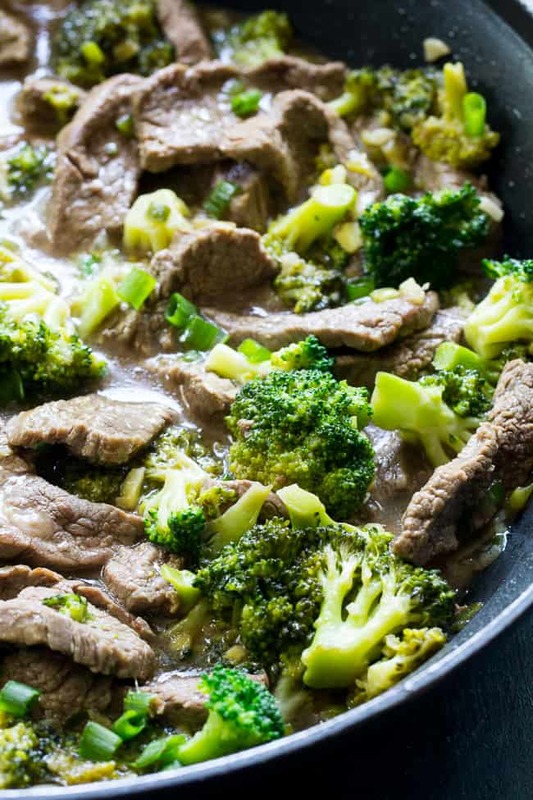 Lastly, add the broccoli and green onion, toss/stir to combine with the beef and sauce and cook while stirring for just 15-30 more seconds, then remove from heat. Top with more sliced green onion and toasted sesame seeds if desired. Serve alone or with cauliflower rice - enjoy! *Coconut aminos is similar to soy sauce in flavor but is Paleo and Whole30 compliant. I buy mine at my local grocery store in the organic foods section but I've also seen it near the vinegar, as well as in international foods section. 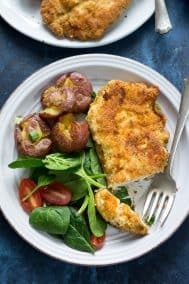 Want more easy Whole30 compliant dinner ideas? Try one of these! 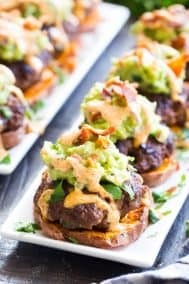 Delicious; Super easy and completely satisfying! 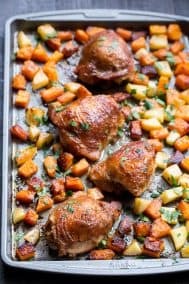 Ummm – I just made this and am eating it right now and this is one of the best paleo/whole 30 recipes I’ve made to date!! Thank you so much!! This looks delicious and super nutrient dense too. Delicious!! No leftovers, will be making this again. We loved it. Unfortunately, I really didn’t like this. Marinating the meat in apple vinegar did not appeal to me at all. what if you don’t have the fish sauce? is there anything else you would use? Omg so good! I’m on day 4 of whole30 and struggling. This hit the spot! Oh that’s great to hear! Hope you try a few more and enjoy – you’ve got this! Fantastic. Wouldn’t change a thing. We loved this! My preschoolers ate all their broccoli. So flavorful. We ate this over cauliflower rice. I bought precut broccoli and frozen cauliflower rice and it made this dinner such an easy one. This is a fantastic recipe. I think it’s one of my favorites of all time! One thing to add though, accidentally sliced up too much ginger root one time before mincing and realized halfway through that I had way overdone it. I decided to just roll with it, and it actually turned out really well! So if you’re looking for even more flavor I don’t see a reason not to add more ginger than originally prescribed. 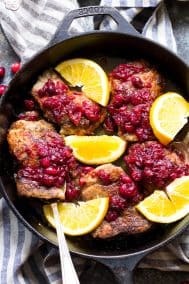 Do you think I can make this in the instant pot ? Yes, I’d say so! Not sure of the timing though. It was a 5 star with the hubby… sad it wont let me sace to Pinterest tho? ?